Crack initiation and propagation is a highly complex and interesting phenomenon. Part of it will be considered in more detail later. Meanwhile a few facts about cracks are stated here, including more or less trivial ones. Fig.1: Silicified peat consisting of squeezed Psaronius with narrow cracks apparently defying any reasonable explanation. Stress may be transient as in impact or permanent as under applied load. Shrinkage gives rise to tensile stress if restricted by constraints. The question whether stress is the cause of strain or vice versa is meaningless. In case of variable strength, the crack chooses an easy path. Although most of the cracks seen on cut chert faces will probably never be really understood, trying to draw information from cracks may be worth the effort. The decay-resistant cuticles on the surface of land plants make discontinuities in the chert which are faces of low strength, which means easy crack paths. Therefore, the crack running along the spherical surface of Pachytheca indicates that this "enigmatic organism" was covered by a cuticle and thus adapted to sub-aerial conditions. Most of the cracks seen in cherts had been healed soon after their formation by deposition of silica in the gap, possibly from the same source which provided silica for chert formation. Cracks which did not heal may have led to the disintegration of the chert layer into rectangular or polygonal fragments found now among the gravel of ancient and recent streams. Narrow cracks with hardly visible gap had formed most probably in hard and brittle material. 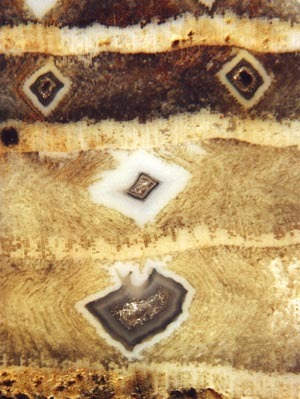 Very wide shrinkage cracks as they are occasionally seen in petrified peat and petrified wood must have formed in an early stage of silicification when the silica gel was still so weak that it did not preclude further shrinkage but was able to keep the fragments suspended in their original position. There are cases where cracks can help to reconstruct the sequence of events which led to the final aspect of the sample. 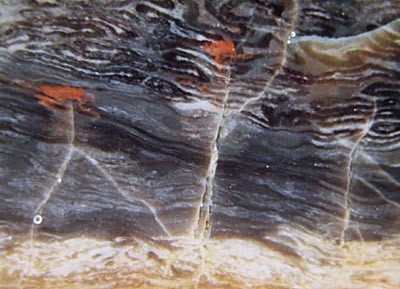 A wide crack through a white spot in petrified wood proves that the spot had formed at an early stage when all was still soft, contrary to another hypothesis. A crack which is narrow in the depth but widens into a V-shape on the surface is a secondary formation resulting from spalling fracture due to repeated impact of pebbles and boulders on the edges. Cracks due to interface debonding can bring forth unexpected shapes. The danger of misinterpretation of cracks as cell walls of fossil plants is there, especially with fossil polygonal crack patterns.